E.O. Wilson was one of more than 1,700 original signators to the “World Scientists’ Warning to Humanity,” a document from the Union of Concerned Scientists sent to leaders all over the world in 1992. On this, the 25th Anniversary of that document’s release, more than 15,000 scientists from around the world have now signed on to the “World Scientists’ Warning to Humanity: A Second Notice.” Dr. Wilson is again a signator. Half-Earth is addressing this challenge directly. 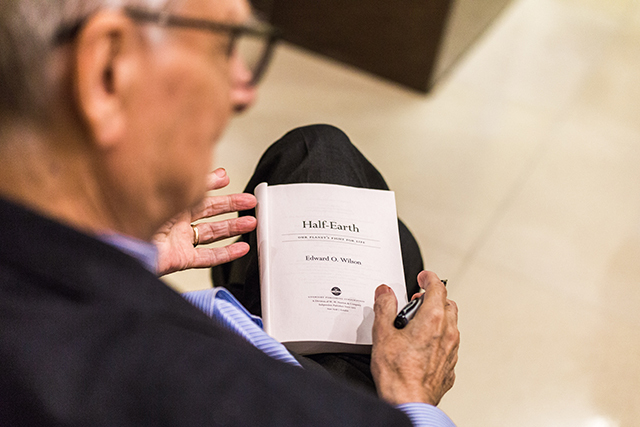 During the inaugural Half-Earth Day held October 23, 2017, in Washington, D.C., scientists led by Dr. Wilson agreed that saving half the Earth was not only necessary, but well within our powers to achieve. Leading with detailed species richness and rarity mapping, the Half-Earth Project is providing the foundation for reaching this global goal, and the scientific leadership needed to address the threat stated in the “Second Notice.” Progress is being made, but much remains to be done.